Earn 674 points to spend on future purchases. At the heart of the RPS II is a powerful Lithium-Ion Battery like those found in most laptop computers. 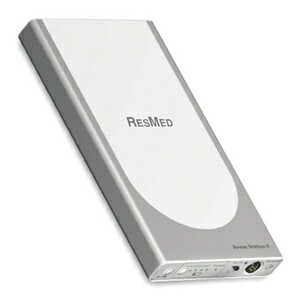 A single battery weighs just 2-pounds and will power your ResMed CPAP for 13-14 hours at 10CM. If you need more power you use the optional Coupler Kit to connect two RPS II batteries in series. When coupled the secondary battery will automatically take over when the first battery runs out. RPS II Batteries recharge with the standard AC Power Supply from any compatible CPAP or BiLevel device so there is no extra recharging cord needed. The RPS II's Travel Bag is designed to hold one or two batteries and includes a handy access panel so that batteries can be connected to a CPAP device or recharged while still in the bag. In addition a zippered pouch on the front of the bag can stores cables and accessories. RPS II is the ideal travel CPAP battery solution for wherever life takes you. It meets all FAA regulations for use on commercial flights, and it's also great for use when camping, biking, or during unexpected power outages at home. In the Package RPS II Battery, Travel Bag, PSU Recharging Adapter, and DC Power Adapter. Select Additional Battery & Charging Options in Cart. Yes, RPS II is Approved for Use on Commercial Airlines This product is approved by the FAA for use on all commercial flights within the US and all international flights that depart or arrive in the US. Click here for TSA / FAA information on traveling with sleep and oxygen therapy. Always contact your airline prior to your flight to confirm any requirements they may have (i.e. a copy of your prescription or a letter of medical necessity) for allowing your device on board. Battery Notes RPS II Battery Packs recharge using the included PSU Adapter and the AC Power Supply with Cord from your existing CPAP or BiLevel Device. The Off/On Switch on the back of the RPS II Battery must be in the 'On' position when charging. Battery should not be left for more than 3 months without being fully recharged. For complete instructions review the documentation that came with your equipment. Heated Humidification & Heated Tubing Using a heated humidifier and/or heated tubing with your battery pack MAY significantly reduce run times. If you require a humidifier with your sleep therapy device consider using it in passover mode, with the heater turned off, to help extend battery life. For additional information on average run times review the Battery Compatibility & Run Times PDF available in the Downloads section of this page. I have complex sleep apnea. That means that I stop breathing during the night, and my AirCurve BiPap machine is a medical necessity. When the power goes out, unless I had a battery backup, I could die. So, for those with Complex Sleep Apnea, this is the only solution for power failure, or when going on a trip where there is not power available. I was disappointed with my purchase. Great accessory and alternative when the power fails. Quite happy so far with 2 weeks of experience. Charged and used once and worked well.